Diamond wedding rings in rose gold, beaded and rope styles are the trend for 2017 . So many choices. Today’s couples have tons of options when they stop by our store, Scott’s Custom Jewelers, to pick out their wedding bands. Whether it’s a custom ring to match exactly, or a completely different wedding ring style altogether, the only rule is: there are no rules! A classic diamond solitaire with contrasting wedding bands. 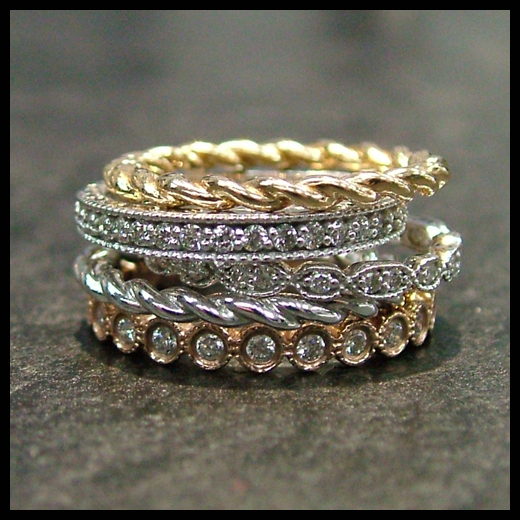 Vintage inspired designs, like these custom rings from Scott’s Custom Jewelers, are very popular. What’s old is new again, and that goes for another wedding ring trend – vintage bands. Delicate beaded edges with small diamonds set into both white gold and rose gold are super stylish. The scalloped edges are key to this beautiful ring design. Sapphires and diamonds are another great wedding ring design. Even though diamonds are forever, sapphires are making a comeback! And not just blue sapphires. In fact, sapphires come in every color in the rainbow. And because they are a sturdy stone, sapphires are great choices for wedding rings. And of course, eternity bands are still the bomb. But with a twist. We’ve been making a lot of these cool ribbon styled diamond bands here at Scott’s Custom Jewelers. Nestled up next to a straight sided engagement ring, or made to match, these eternity bands really stand out, and look great by themselves too! Whatever your style, we can help. Stop by and let’s make something beautiful, together!